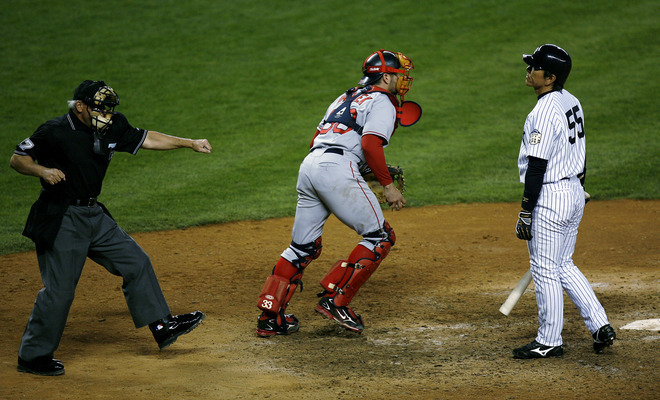 In recent years, home plate umpires’ masks have been soild black — the padding, the bars, the stripes, everything. Lately, though, I’ve noticed a change: Some umps’ masks have silver bars, and other have tan padding — sometimes just on top (although I think the upper padding is actually being covered by a plastic visor insert there, so it’s hard to be sure), sometimes just the inner padding, sometimes all over). It’s a small thing, but it’s really jumped out at me during some centerfield camera shots — the ump’s head is suddenly much more visually prominent. I know several of you out there are umpires. Care to enlighten us regarding this development? Have colored bars and padding been available on the sub-MLB level for a while now? Did color-accessorized masks actually surface in MLB prior to now and I just hadn’t noticed? Request for Technical Assistance: I’ve been using iShowU to make video captures (works great!) but have been having trouble transferring the resulting video clips to YouTube. The initial upload goes fine, but then, after the video is processed, I usually get a “Failed” message (except for two instance when the processing was successful, but I’ve been unable to duplicate those results). Same thing happens with Google Video. I think it has to do with the compression, but I’ve tried several different formats (Apple Intermediate Codec, Sorensen Video 3, Jpeg 2000, etc.) — no dice. If anyone knows more about this and wants to give me some free advice, I’m all ears. May Raffle: It isn’t football season, but that hasn’t stopped our friends at Helmet Hut from generously offering up an giveaway item from their vast inventory. The lucky raffle winner will get to choose any non-autographed helmet from Gridiron Memories (Helmet Hut’s retail arm) — NFL, NCAA, WFL, whatever. To enter, send an e-mail to uniraffle [at] earthlink [dot] net (please note that this is not the usual Uni Watch e-mail address) by next Tuesday, May 13th, at 10pm. Nobody will be reading the text of these e-mails, so bother to include anything other than your name. Only one entry per person, and please don’t try double-entering from multiple e-mail addresses or anything like that — there’s nothing lamer than cheating on a free raffle, and we’ll probably figure it out anyway. I’m no longer using raffles as a way to build memberships, so no more bonus entries for membership program enrollees. I’ll announce the winner next Wednesday. Speaking of the membership program, today’s spotlight member is Conor Clougherty, who hopes to become an NFL ref one day. Sharp-memoried readers may recall that I interviewed Conor last year about officiating attire. For those who missed it, that entry is available here. You can see other new card designs, as always, in the membership card design gallery. Also, as I promised/threatened a week or two ago, I’ve updated the membership roster — no more “Membership Level” column, and charter members now have their names shown in bold (if I missed anyone, please let me know). Uni Watch News Ticker: Intern emeritus Vince Grzegorek stopped by Uni Watch HQ last night — our first face-to-face meeting after a year and a half of me exploiting him working together. Scott M.X. Turner showed up too, although he pulled the cold shoulder routine when Vince failed to guess the exact fiber content of his jacket. ”¦ Great story here about a jersey worn by two future Hall of Famers (with thanks to Joey Morris). 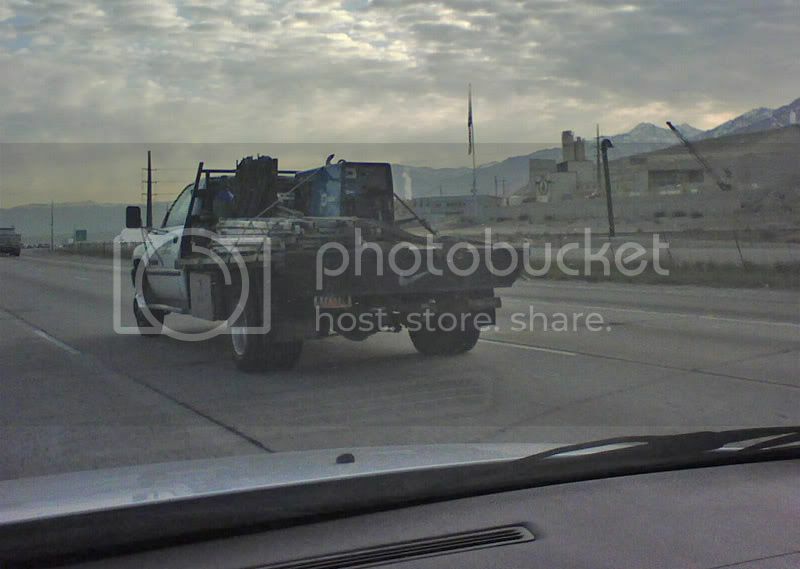 ”¦ “I saw this the other day on my way to work,” writes Eric Westover. “I didn’t know Nike made trucks.” ”¦ Here’s an updated listing of special MLB jersey dates (some of which, as you can see, have already happened), courtesy of our friends at Jersey-Joe.com (who are selling many of the special jerseys here)”¦ You might know that author Tom Wolfe is partial to white suits, but I didn’t know that he also favors vertically striped socks until I got this shot from Craig Freeman. ”¦ Awesome gallery of old Federal League hockey logos here (with thanks to Andy Head). ”¦ The Blackhawks recently announced a new radio deal, which led — of course — to a jersey photo op. ”¦ Greg Riffenburgh notes that there’s an odd sleeve seam (or extension..?) on Willie McGinest’s jersey. ”¦ Here’s something I haven’t seen before: Kenji Johjima appears to be wearing a Mariners logo on the brim of his catcher’s helmet (with thanks to Andrew Thomason). ”¦ Chris Glover reports that Brian Barton of the Cardinals gave the first baseman a whuppin’ had to change belts while running the bases last night. ”¦ “The Nippon Ham Fighters are going to wear special uniforms in July for the ‘We Love Hokkaido Series,'” reports Jeremy Brahm. ”¦ According to the “Miscellaneous Items of Interest” listing at the bottom of this page, Randy Johnson wore No. 34 for part of the 1993 season. I’d never seen a photo of that until Doug Kyed sent me this. I know Paul no longer wants sexist comments, But is Randy Johnson attempting to be a pole dancer? I will leave the rest to everyone’s imagination. On the White Sox 1983 day, doesn’t look like the visiting Royals are going to wear retro uniforms too (which is pretty par for the course for White Sox TBTC days, I can think of at least a few times they haven’t and can’t for sure think of any times they have). Kind of a shame they didn’t schedule it against the Jays, the road team could have participated without even having new jerseys made. 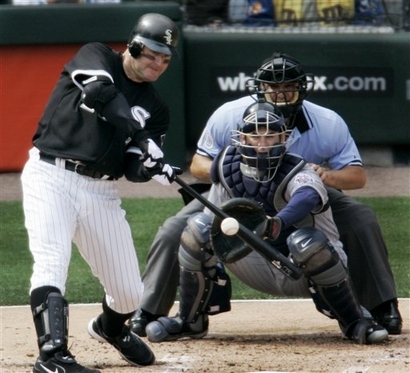 I think most of the time you see a silver umpire mask it’s probably the Nike Titanium model. During last nights Jays broadcast (top of the 7th or 8th if anyone wants to go back on MLB.TV to watch) they talked about the mouth guard that McGowan and Marcum have both been trying out. Apparently it is one of these , designed to improve jaw alignment, which apparently does a whole bunch of good stuff including increasing your strength and flexibility. Sounds like a bunch of bull to me, but the way these guys have pitched so far this year seems to lend some credibility to it. 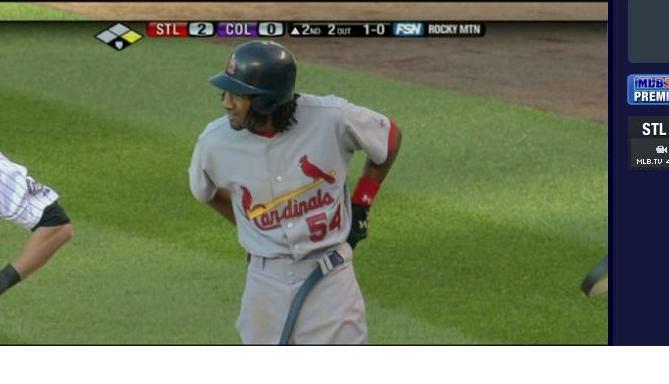 [quote comment=”267806″]I know Paul no longer wants sexist comments, But is Randy Johnson attempting to be a pole dancer? Here’s a challange, can anyone find a picture of a more embarrassing pose for any sports player that beats the Randy Johnson “Ballerina” pose? I doubt it. That’s horrible. the most unusual aspect of the Johnson photo is, he’s smiling. Obviously time for the ‘Big Unit to retire…. 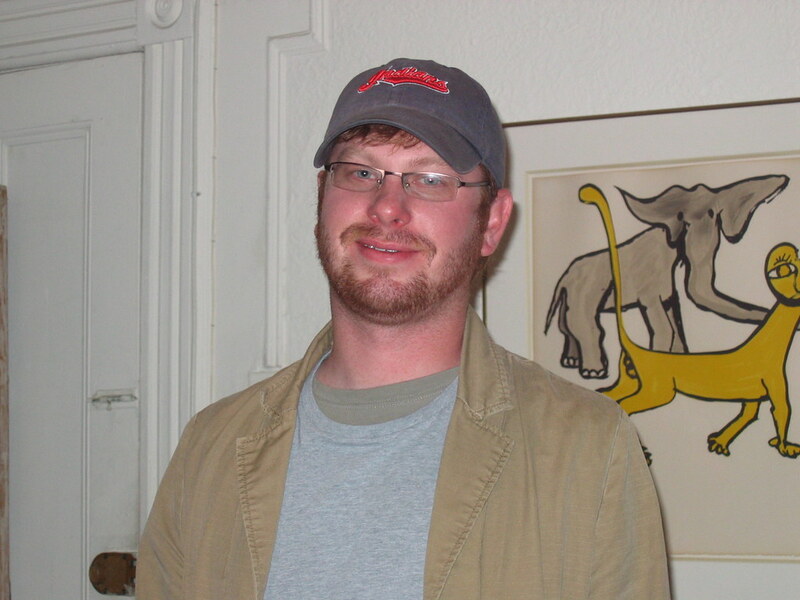 I see that a prerequisite for working for Paul is wearing glasses and having facial hair. That is easily the most disturbing baseball pic I have ever seen. He looks like a hick ballerina with a mullet!! Colored bars have been available for some time on umpire’s masks. The silver bars are actually titanium. They are lighter and stronger than tube steel. +POS is just one company that provides umpiring equipment, and they have lots of colors (red, blue, black) with different pads from nylon to smooth and suede leather. When I umpired, I switched to the hockey mask b/c of concussions. The hockey mask deflected the blow by foul tips, provided better vision, and the force wasn’t absorbed in just two places (forehead and jawline). In the mid-90’s, umpires wore navy, light blue, and red shirts, so you can see why they would want the mask to match the shirts. Then they added a kind of silver, which morphed into a light cream (similar to the Giants’ home jerseys). I like the black shirts in MLB, and the light blue is OK. In Iowa, the high school athletic association has said that umpires only match for regular season games, but insists on navy blue for district play and above. Since this is the only state that plays summer ball, the temps can be brutal in dark blue. 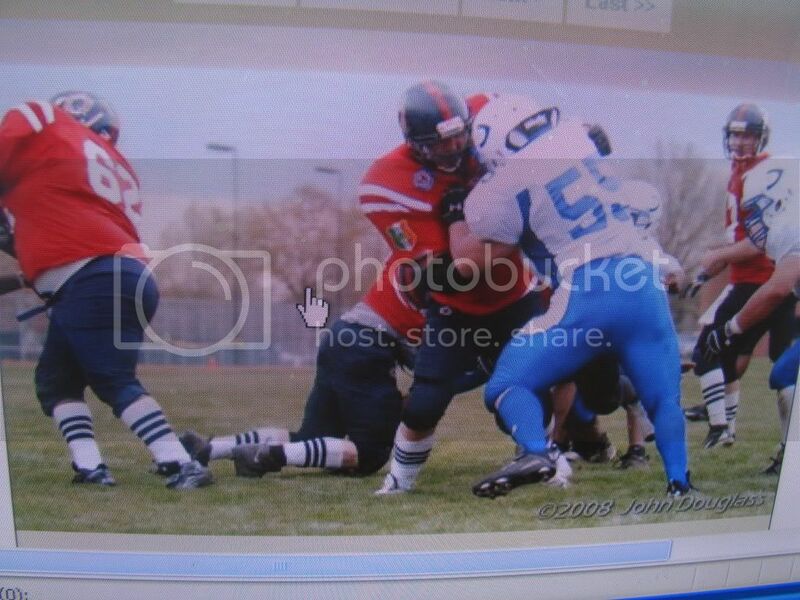 Part of the reason I got out of umping at the high school level. Who did the painting in this photo of Vince? The Lancaster Gears logo is probably too detailed to duplicate in the margins of your notebook, but man, that is pretty clever. When a guy gets traded, released, whatever… What happens to their uniforms (and other gear). Do they take it with them?? Does the team save it?? The reason I ask is this…. Brent Barry was included in the Spurs/Sonics trade earlier this year, then subsequently released by the Sonics. 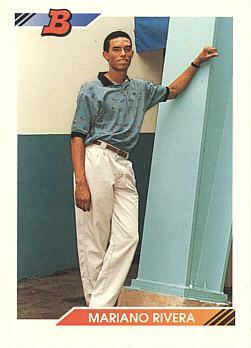 He signed with th Spurs (surprise, surprise) a few weeks later. When he got back to the Spurs, Did they reissue his old uniform or did they have to give him a new one??? I dig Scott’s NYAC jacket. Where can I get me one of those? The DC General’s are a local football team made of public safety officer from throughout the DC, MD, VA region. Here is a story on them and some good shots of their uniforms. They harken back to the NJ General’s in the logo, but some players wear the patch of their home agency on their shoulder. The socks will certainly gain some attention here…. In that ballerina picture of Randy Johnson, his cap logo and sleeve patch look like the ones from the current navy/teal Mariners uniforms, but the blue in his uniform is the royal blue from their old blue/yellow uniforms. Tonight, Chris Paul will HONOR AN 8-YEAR OLD FAN who died Monday before he could meet his basketball hero. Does anyone think this is a bit over the top? For the record, I love ‘42’ day, but what’s next, signing bonuses (reparations)? I know MLB is desperately trying to make their draft media relevant, but c’mon. I wonder if heat is a factor in umpires choosing their masks. I was a catcher for awhile and the black padding in those masks gets much hotter in the sun than the tan padding. [quote]Colored bars have been available for some time on umpire’s masks. The silver bars are actually titanium. They are lighter and stronger than tube steel. as for embarrassing pictures of athletes, this ad doesn’t do any favors for Carson Palmer. Why Carson, why? [quote comment=”267838″]In that ballerina picture of Randy Johnson, his cap logo and sleeve patch look like the ones from the current navy/teal Mariners uniforms, but the blue in his uniform is the royal blue from their old blue/yellow uniforms. Where do you work, Chernobyl? I’d liken that Nike symbol to the same people who put Penn State logos on EVERYTHING in my area. The farther you get from the city though, its the rebel flag that is monogrammed all over. [quote comment=”267824″]Colored bars have been available for some time on umpire’s masks. The silver bars are actually titanium. They are lighter and stronger than tube steel. Speaking of umpire gear, whatever happened to the big hand-held chest pads the umps used until late 1980s. Did it just become too ackward or what? [quote comment=”267843″][quote]Colored bars have been available for some time on umpire’s masks. The silver bars are actually titanium. They are lighter and stronger than tube steel. That Randy Johnson photo is something else. 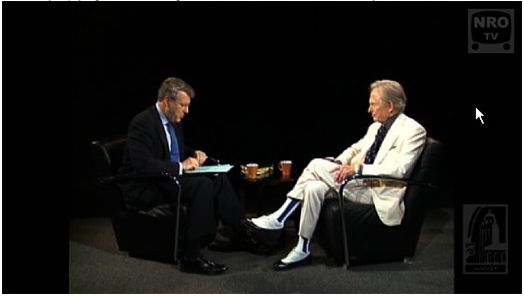 I would have loved to have attended that discussion…. [quote comment=”267855″][quote comment=”267824″]Colored bars have been available for some time on umpire’s masks. The silver bars are actually titanium. They are lighter and stronger than tube steel. The balloon or raft protector started to go away when the American League went to the inside protector in the late 70s. The inside protector provides additional protection, freedom of movement, and a better view of the lower half of the strike zone by moving the umpire out from directly over the catcher’s head. [quote comment=”267840″]Does anyone think this is a bit over the top? I’ve been umpiring baseball games for the last 16 years, and there have always been colored pads and bars for umpire masks in the catalogs that I’ve seen. I don’t know anyone personally who has a mask with silver bars, though. I’ve only seen the black and blue ones up close. One of my masks has black pads, the other has tan. Darker pads hide the sweat and dirt stains better. All the bars on my masks are black, including my goalie helmet mask (which has an All-Star logo above the mask and a stars-and-stripes MLB logo on the front of the chin). I don’t know anyone who uses the bubble chest protector anymore. A lot of the Little League fields I work at have one on hand in case there are no umpires and a parent is called into action to arbiter the contest. Although they don’t offer as much protection as a bubble, interior chest and leg protectors are much more comfortable and allow a greater range of movement without carrying a bulky piece of padding. And as least for the time being, my organization uses a dress coade of navy or light blue shirts with gray pants. We haven’t gone black. Yet. We switched from strictly light blue to navy w/light blue option when the MLB did, so anything’s possible. [quote comment=”267845″]as for embarrassing pictures of athletes, this ad doesn’t do any favors for Carson Palmer. Why Carson, why? If you think Carson Palmer’s acting(?) 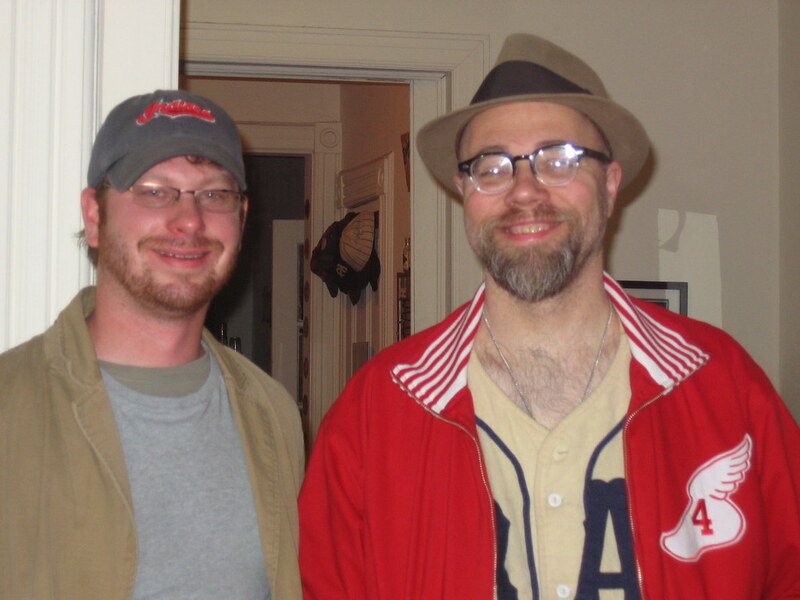 is bad, wait till you see Bronson Arroyo for two local companies. 2. Champion Ford (http://www.youtube.com/watch?v=0I-2YW0IzUU) NSFW! 2. Champion Ford http://www.youtube.com/watch?v=0I-2YW0IzUU NSFW! do they even use those designations anymore? [quote comment=”267835″]The DC General’s are a local football team made of public safety officer from throughout the DC, MD, VA region. Here is a story on them and some good shots of their uniforms. and the Cobras very closely resemble Odessa Permian in the television series “Friday Night Lights” including the Schutt DNA helmets and Under Armour gear! And lets hope #62 on the Generals is a “house cat” and has desk duty! Nah, that’s the Point of Mountain between Salt Lake and Utah Counties. Although, you could argue that Utah County is as much of a desolate wasteland as Chernobyl. did these guys just spark some hippie lettuce or what? He looks like an intern or something! I know people will take this the wrong way…but the scenery looked like it was out of “Brokeback Mountain”! NTTAWWT! Actually, an excellent film! 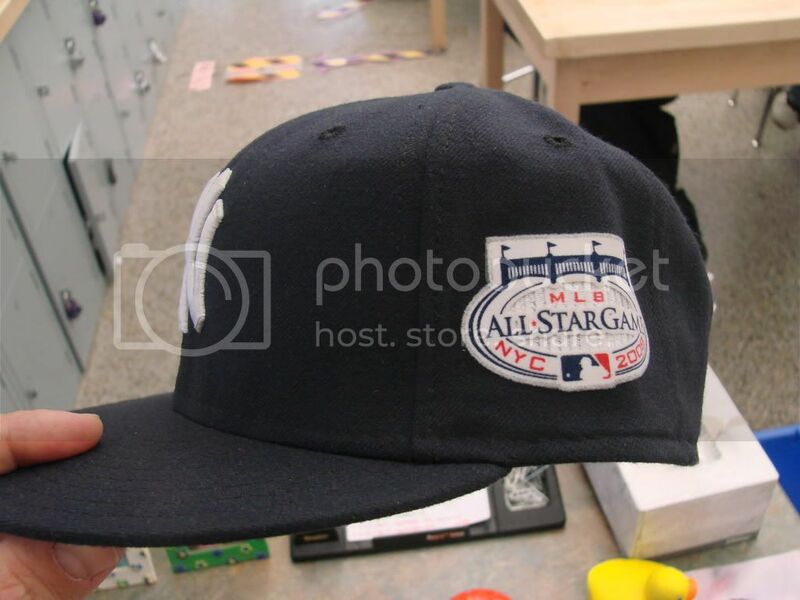 Back to unis…One of my students brought in his Yankees ASG 5950 and there was something interesting about it. The patch seemed to be double layered! The pics might not convey it though, sorry! Ugandans don’t need no stirrups! [quote comment=”267825″]Is facial hair required to work at Uni Watch? Does Bryan have facial hair? Ugandans don’t need no stinking stirrups! 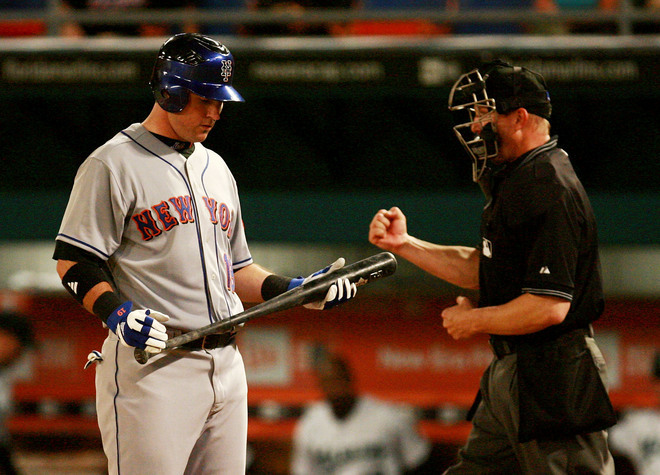 BrianBarton was changing belts because his broke when he dove back on a pick-off play. 1B coach Dave McKay handed him his own belt. He’s in very good shape, so it wasn’t TOO big on BB. Wow, those D.C. Generals unis are sharp! I spy with my little eye…hanging in the background what appears to be a 1917 White Sox cap. Could it be the cap of this infamous scoundrel? Apparently the batter doesn’t need any pants either. Anyone else notice that the child batter is wearing a BEER shirt? And the shortstop is wearing a Jim Kelly/Fran Tarkenton Four Time Super Bowl MVP mash-up jersey. And what’s up with David Schwimmer sitting in the bleachers? Probably won’t be the first to comment on it but that Randy Johnson photo has got to be one of the gayest pics I’ve ever seen. Period. Didn’t Randy Johnson switch to 15 during one of his seasons with the Mariners while going through a slump only to switch back to 51? Hitler? Who said anything about Hilter? How can one kid be totally outfitted in a baseball uni (non matching) AND catcher’s gear, and they can’t find the batter some PANTS!! An interesting note that Paul might like is that if the umpires are using the Nike mask with the stock padding and harness they must black out the swoosh and anything that has NIKE on it. The umpires are contracted to wear only Wilson branded protective items, but if they wear others the logos must be blacked out. The difference you see in the Wilson Masks with the Black and Tan padding is that the balck is called Amara padding and is almost a soft suede leather feel. The tan is made of Deer/Doskin. Many umpires used to wear a mask that somewhat matched the shrits they wore. Dale Scott a few years ago when the AL was wearing the Dark blue would wear a navy mask. 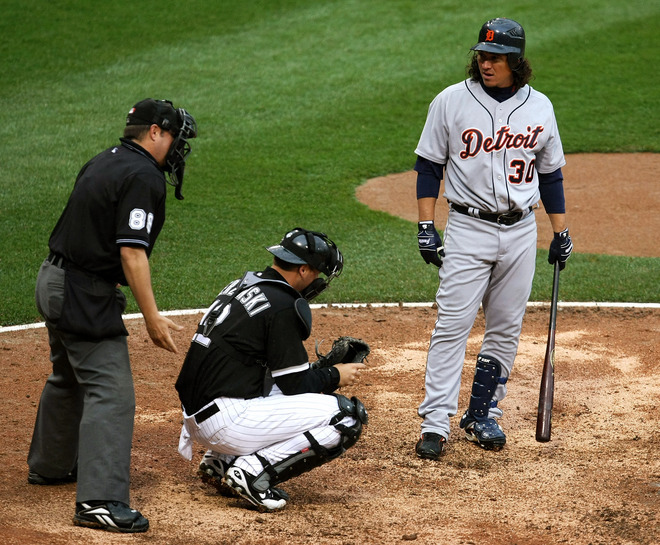 and yes those are Reebok plate shoes on the umpire in the Tigers/White Sox photo. These are a new addition to the line this year, not available to the public. They are a normal base/turf shoe adapted to be worn behind the dish. How many Popes get their name on the back of a jersey? johnson wore 34 as a tribute to nolan ryan during his last start against the rangers in 1993 (dunno the exact date). ryan’s arm had fallen off on sept. 22 of that year in his final appearance . . . against the mariners. johnson has always credited a throwing session with ryan late in the 1992 season with turning his career around (apparently it did. as casey once said, ‘you can look it up”). i was under the impression that johnson wore 34 for only the one game, but it could’ve been more. 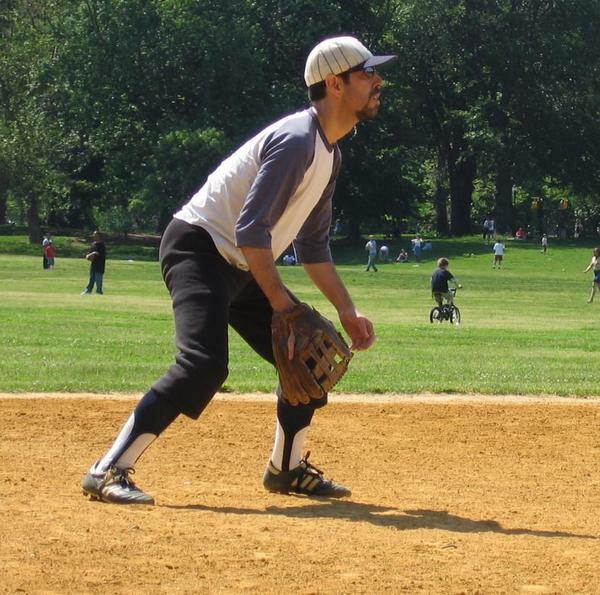 The New York Times Bats blog has a brief history of the stirrup. As I can;t find the buttons to enable links, I paste it. [quote comment=”267915″]How many Popes get their name on the back of a jersey? 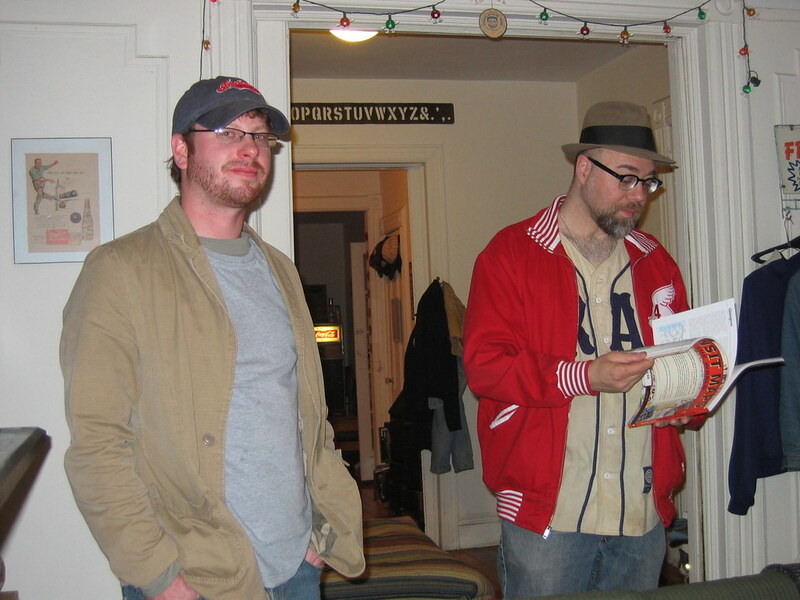 [quote comment=”267891″]I spy with my little eye…hanging in the background what appears to be a 1917 White Sox cap. I stand corrected…It is what I believe to be a 1914 Brooklyn Dodgers cap. [quote comment=”267925″][quote comment=”267891″]I spy with my little eye…hanging in the background what appears to be a 1917 White Sox cap. [quote comment=”267928″][quote comment=”267925″][quote comment=”267891″]I spy with my little eye…hanging in the background what appears to be a 1917 White Sox cap. mattress, but he retired this year. Johjima’s helmet has a rubber attachment where the team logo would normally go, so they put the sticker on the brim instead. It was discussed a few games ago on the radio broadcast, after his regular helmet was shattered by a batter’s backswing in Cleveland. Dont have time to read through all of the posts today but the masks with silver bars are either made by Nike or us (Easton). Paul – if you want one to compare the drastic weight difference let me know…you have my email address. whoops! didn’t see the part at the end! I think a nice perpetual benefit of being an uni-watch member would be getting an additional raffle entry. Charter members should get two. As a Charter Member I have a vested interest in the later, but the fact is the program did change after we all joined. Just wondering if anyone noticed Derek Jeter’s left armband with an Air Jordan logo on it. Did you know Nike made baseball items with the Air Jordan logo? 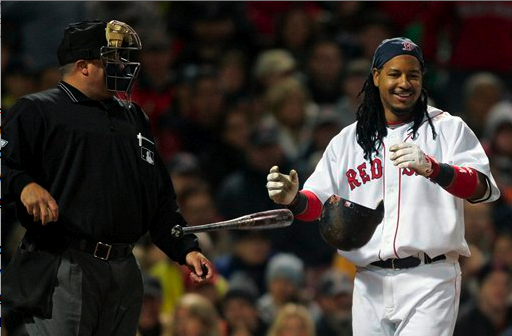 I\’ve actually been looking for a new umpire mask for that reason right there. The black padding gets quite hot in the summer. I\’ve also been looking for one of those visor inserts for the top part of my mask to block some of the sun, no luck yet. So if the black makes it so hot in the summer, why do umps wear the black polos almost every game? 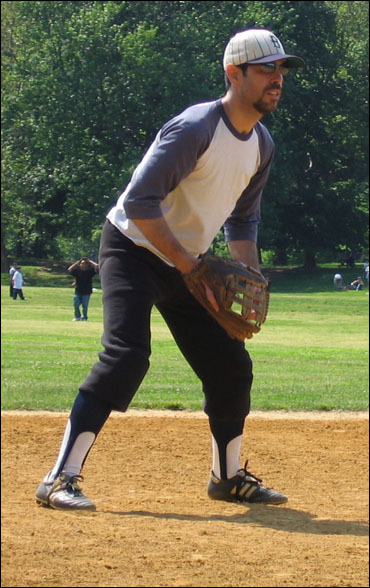 [quote comment=”267973″]Just wondering if anyone noticed Derek Jeter’s left armband with an Air Jordan logo on it. Did you know Nike made baseball items with the Air Jordan logo? The Jordan line gets used in different sports. Nike makes it their “top of the line” line. Jeter and Carmelo Anthony are endorsers of the Jordan line. There must be others…anyone? Every season, several NPB teams use special uniforms for interleague games. The Tigers used 80s throwbacks in 2005 that were so popular that they became the regular uniform a season or two later. Lions also used the bright blue 80s throwbacks one year, that was cool (that was the team’s golden era). This season, Lions have horrendous interleague alternates (last year’s alternates were pretty bad too). And Fukuoka Softbank Hawks are celebrating their 20th year in Fukuoka by wearing throwbacks from both their Nankai and Daiei eras. Because it matches their ballsack? 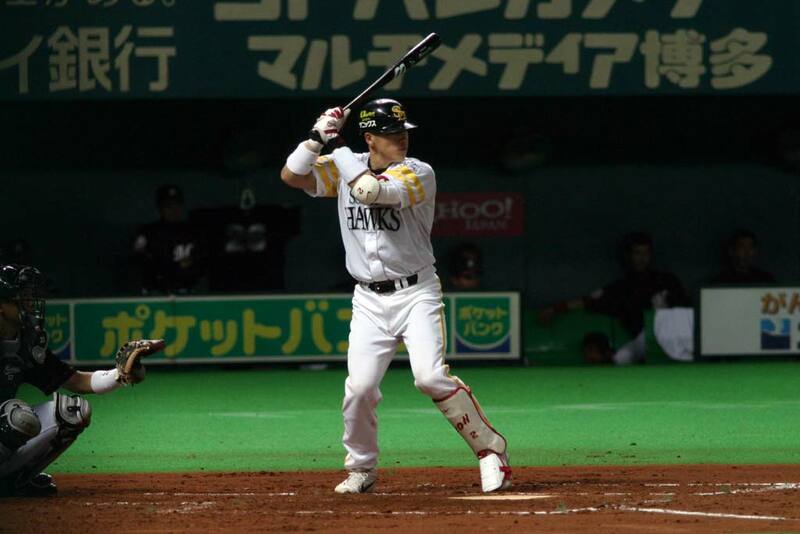 [quote comment=”267987″]Fukuoka Softbank Hawks are celebrating their 20th year in Fukuoka by wearing throwbacks from both their Nankai and Daiei eras. so kenji johjima…is he wearing a throwback, or is the ‘throwback’ from just a few years ago? [quote comment=”267981″][quote comment=”267973″]Just wondering if anyone noticed Derek Jeter’s left armband with an Air Jordan logo on it. Did you know Nike made baseball items with the Air Jordan logo? Andruw Jones wears modified Air Jordan III cleats. Sheffield used to dabble with Jordan Brand a bit before creating his own company this year called SG3. Ryan Zimmerman wore Jordan brand cleats as well. ANd then theres the Jordan Brand Motocross team. 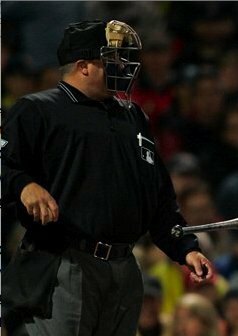 Black is slimming and most umps are fat asses? 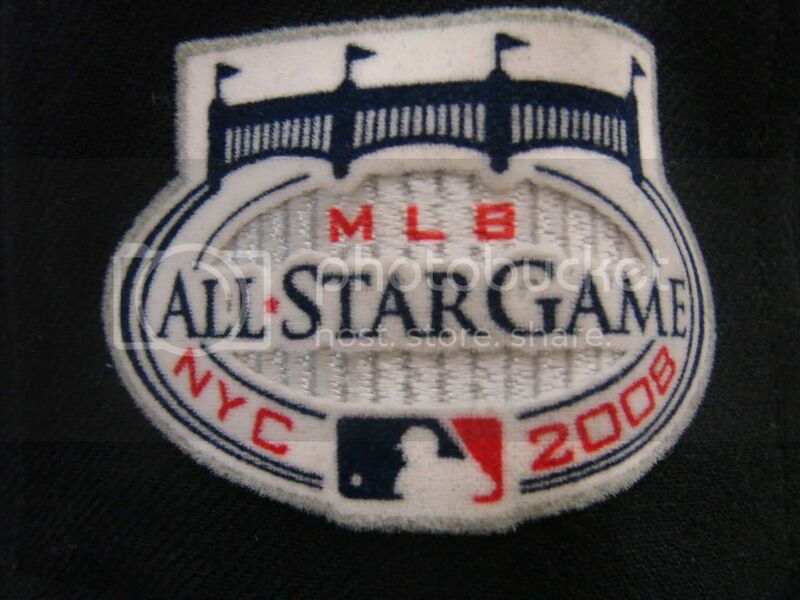 Silly me, Sheff’s company that a few MLBers like Lastings Milledge wears is called, coincidentally: GS3! Fogot Mike Bibby as a JB guy too! No, it’s just for the players that would rather be associated with the Jordan brand than the Nike brand. Some Jordan stuff is really crappy, while some of it is nice, same with regular Nike stuff. Mr. Lukas has a little side bar on Page 2 today. It is about the replica batting helmet collecting guy. Check it out before it disappears. I’m just catching up on the past several days, so I apologize for being woefully late with this comment…I have several small black and white pictures of the 1968 Athletics that clearly show, even in B&W, the green-gold-green sequence on the pants. However, in one photo it appears that “Blue Moon” Odom is pitching while wearing an other-than-green hat. Anyone know if they wore an “alternate”? [quote comment=”267991″][quote comment=”267987″]Fukuoka Softbank Hawks are celebrating their 20th year in Fukuoka by wearing throwbacks from both their Nankai and Daiei eras. Daiei sold the Hawks to Softbank after the 2004 season, so Johjima played on both versions of the Hawks. 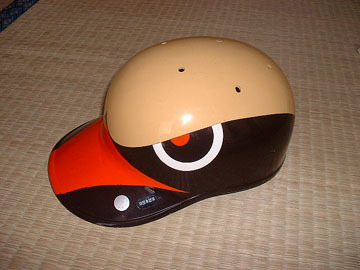 Incidentally, when the Hawks were bought by Daiei and moved to Fukuoka in 1989, they used to wear hawk helmets. And I really mean, hawk. Haha, Matt, I knew you would be all over the Jordan Brand question! Here is the complete list of Jumpmen. Yeah that’s irksome, but what about the f*cking word mark? Lame. Pay attention Toronto: the newspapers will shorten your name. Don’t do their job for them. Your owners picked a different name for your team. Show it. since the ‘jays’ hardly have any BLUE left on their unis, does it really matter? Thought this would be of UniWatch interest: apparently in the UK, Logo Creep is now a crime fighting tool. OK, LI Phil. I’ll assume your birth certificate name is Philip, and that you go by Phil on a colloquial basis just to knock out a syllable, right? Well, the day you’d be allowed to declare ‘Phil’ your legal name without filing special paperwork and without its approval, I’ll accept the Toronto BLUE Jays and the Arizona DIAMOND-Backs’ using their nicknames on their jersey fronts. That’s kind of old news. 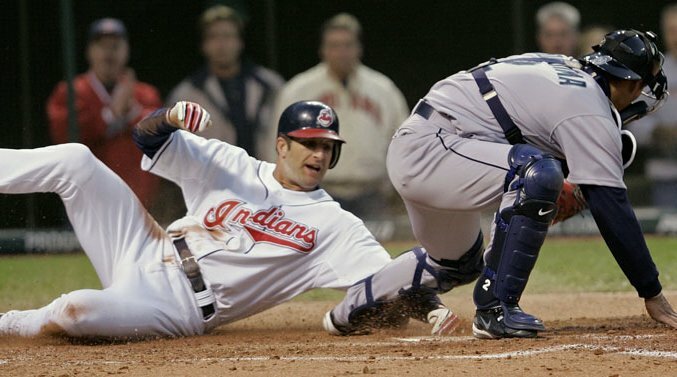 The real news: Cleveland dispels the myth of the “two jersey rule” in the playoffs. The striped-piped navy jerseys are back tonight after a laid egg with the wines in Game 1.
my point tho, was more that do the “blue” jays, since they lack blue in 99% of their uni, even want to be referred to by that moniker? and, part deux…should they ditch that sweet black jersey and put more blue in their togs? The umpire shirts are all the moisture-wicking ones now, so color makes little difference. Some umpires wear the light blue, some wear black. And if you’re working the dish, the inside chest protectors are almost exclusively black or dark gray, so the shirt color means nothing as far as heat retention. Color preference is probably more psychological than anything with the new style of jerseys. Memorial patches dept: my son’s 14-year old baseball team had an opponent last night with a black rectangular memoral patch…with the initials of perhaps a deceased teammate. that astronaut who “threw” out the pitch at Yankee Stadium a couple of weeks ago is sure making the rounds. he just appeared on the Colbert Report with “Wriststrong” bracelet and all. It was at the Jake. I’m interested to osee how many of us begin posting here! Since Canada got new unis and 15 out of the 16 teams wore throwbacks, I decided to do a quick review on the jerseys worn at the IIHF World Championships going on right now. I haven’t read all of the comments to see if it’s already been said, but I thought I’d put my 2 cents in on the silver facemask bars. I know that Bauer and other hockey companies make full cage shields with silver bars instead of black to improve vision. It’s called something like TruVision. Supposedly the silver bars make it easier not to focus on them. Maybe umps are in favor of these so they can see the ball better? Also, perhaps it’s ironic that these ump masks are made by Nike while Nike used to be partnered with Bauer before they recently ended the partnership and bowed out of the hockey market. You do know its bryan right? uh…you mean spencer knows, yes? Why does Carlos Silva’s glove say “Justin Silva”? Why can’t Paul give us a warning a day before, when he’s going to be off and when there won’t be anything on the site? Once Labatt sold the team, ownership had much less incentive to emphasize “Blue”. I guess the comments are back on. I found this website on NASCAR paintjobs. I know now exacly uniforms but in a sense you see them alot more than you see the uniforms. Ill try to repost tomorrow if I get a chance. The idea on this one is that since MLB is now giving these guys pensions, each team will draft the players and pay their pensions. It’s kind of a cool idea. Instead of just giving them honorary pensions, they are adding being drafted by a MLB club to their resume, then each club pays the pension. Back in the day when the NBA had a 10-round draft, teams would draft for a few rounds, then pass when they had their roster filled. In 1982, the Celtics took all the players they intended to select, and with their next pick, instead of passing, selected Landon Turner of Indiana — who was a pretty good player before a car accident left him paralyzed. Nice honorary move by the Celtics.